Due to the Bobby Fire which was spotted on Wednesday August 15 at 4:20pm, fought aggressively on Thursday and held to 16 acres, we will use the following alternate course for the 2012 Waldo 100K. Runner and Volunteer Safety are our primary concern. The Forest Service, after flying over the fire today, has agreed to let us use this alternate route. Be aware that there may be smoke in the area. 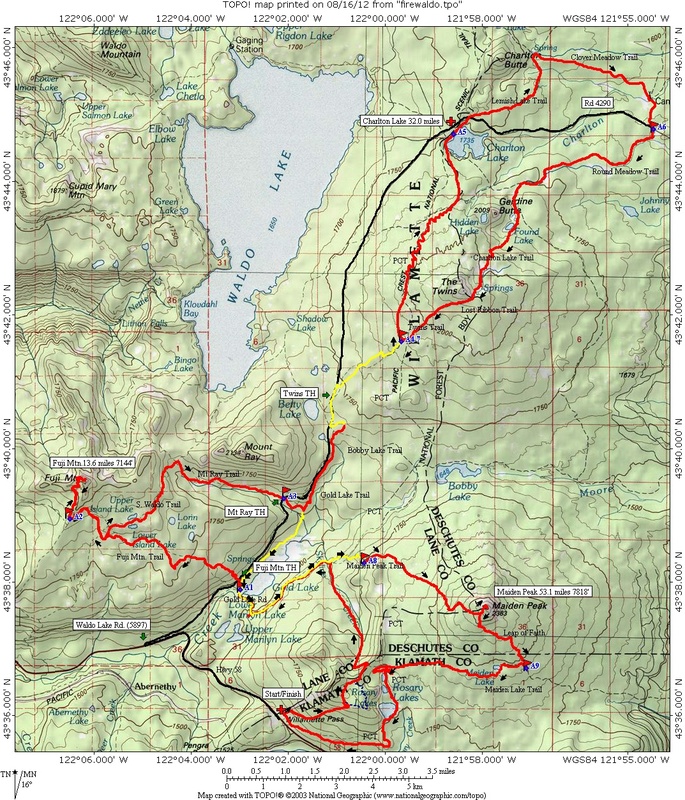 This alternate course preserves the meat of Waldo and all of the aid stations while avoiding the Bobby Lake fire area. It adds approximately 3 miles to the total distance which will be closer to 65.6 miles. There are two changes. The first is the route between Mt Ray (A3) and the Twins (A4). After leaving Mt Ray aid station runners continue east to Gold Lake trail and up to Bobby Lake trail. Instead of going east we go west out to Waldo Lake Rd. We turn right and follow Waldo Lake Rd for about 1/2 mile to the Twins trail. Follow the Twins trail uphill for about 1.5 miles to the Twins aid station (A4). You’ll get to the Twins in about 1.7 miles less than the regular route. From the Twins (A4) we’ll follow the normal course up and around Charlton and Rd 4290 aid stations before returning back to the Twins the second time (A7). The second change is from the Twins (A7) to Maiden Peak aid station (A8). 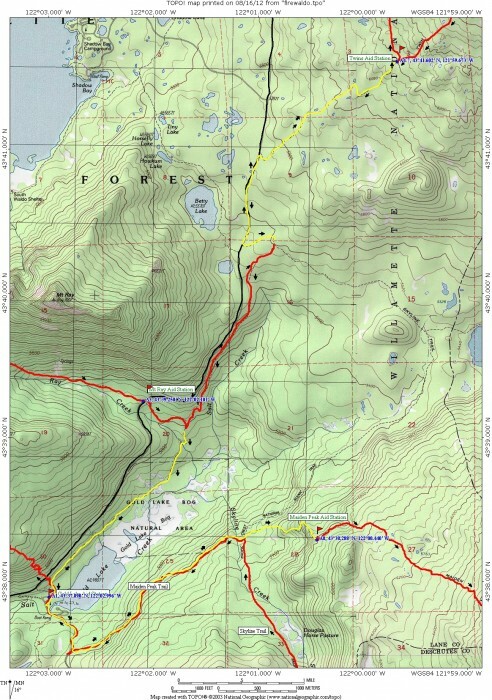 Instead of going south on the PCT, we’ll go back out to Waldo Lake Rd via the Twins trail, down the road to Bobby Lake and then east 1/4 mile to Gold Lake trail. We’ll follow Gold Lake trail all the way down to Gold Lake Campground and the first aid station of the course. We’ll then go through aid station and out the gravel road 500 about 1/2 mile to the Maiden Peak trail. We’ll go up the Maiden Peak trail about 3 miles to the PCT where the Maiden Peak aid station is (A8). From there we’ll follow the normal course up and over Maiden Peak and back down the PCT on the beautiful downhill finish past the Rosaries. Intermediate cutoffs at Charlton (A5), Rd 4290 (A6), and the Twins (A7) will remain the same even though they are a mile shorter than the regular course. That is, 1:00pm, 2:15pm, 4:30pm, respectively. Because the course is 3 miles longer and it all comes near the end, we will give you an extra hour, until 10:00pm, to finish and get a hat. Gold Lake aid station will be open for the second time at mile 49.6. It will have minimal aid but you will be able to pick up your light that you dropped off in the morning.